Congratulations to the Top 4 of Sunday’s Dragon Duel! Here are the Top 4 Duelists from Saturday’s Dragon Duel Tournament at the 200th YCS Columbus! Saturday’s Dragon Duel Top 4! Here are your Top 4 Dragon Duelists! Here are the final standings for the Dragon Duel event at the North America World Championship Qualifier. Congratulations to all Dragon Duelists! North America WCQ: Sunday’s Dragon Duel Tournament! Today’s Dragon Duel tournament gave young Duelists a first opportunity to qualify for next year’s Dragon Duel World Championship Qualifier. Check out the top 4 Duelists of today’s Dragon Duel Public Event. All of them are now qualified to compete in the 2019 Dragon Duel World Championship Qualifier! North America WCQ 2018: Dragon Duel Top 4! 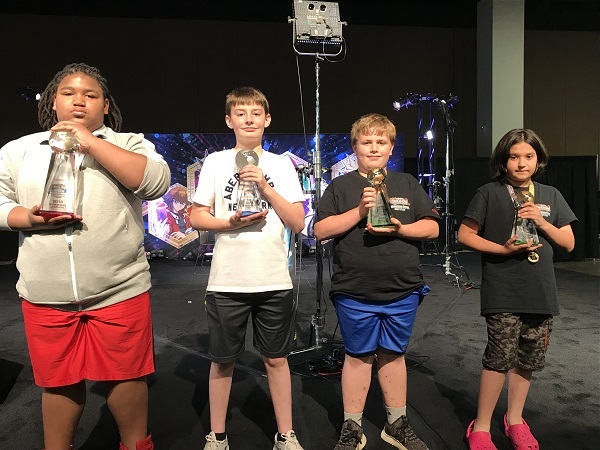 Congratulations to our Top 4 Dragon Duelists! The first five Swiss rounds have concluded – here are your Top 8 Dragon Duelists! Here’s a look at our Dragon Duelists, including their Decks and countries of origin.